I'll say, those waves look sick!! Jealous I missed out on that!! Sure beats the hell out of wakesurfing. Glad to hear Johnny scored as well. Hope you get some more nice days out there with Ethan! Michael wrote: I'll say, those waves look sick!! Jealous I missed out on that!! Sure beats the hell out of wakesurfing. Glad to hear Johnny scored as well. Hope you get some more nice days out there with Ethan! Two more sessions with Ethan (wish it had been more). Bombs. Foggy morning session. Denied entry at tinnies so headed up to the cove to sneak out in the corner (it worked). Caught a few ‘warm-up’ waves that were well overhead high and flirted with almost coming in too far. Was working my way back out and saw Ethan drop into one that looked double overhead high and watched him rip left on a towering wall of water and really hoped he was going to outrun the pending explosion (and he did). We kept working south and rode a few off Incinerator Rock. I followed one soft right in a few hits too many and paid the price when the marching band of tall walls followed me in. I drove into the face of one slab that I thought was going to break my board (thankfully it didn’t). Bigger than yesterday and a day to choose your battles. Ethan spotted the Pacific dolphin I had seen the day before. Really impressed with how much Ethan has stepped it up this year (he is really going for it). Fog cleared just in time for sunny picnic lunch on the beach before departure. Nice! Steve Smith pump track bike park in Nanaimo, Ethan on the ferry, lake-side sunset dinner at Cameron Lake and back to Tofino campsite by 11:30 pm (day of driving and sessions like the south Oregon Coast). Demi-fog. BWD, Udder, Jake, Shaggy (surf), and myself all headed out into the demi-fog. Tough to make it out until windows provided by the lulls. The wave count was tied for a while – at zeros as it was a little hard to catch them at first. Then we headed up to the crab trap and BWD said, “Looks like we found the spot”. Smooth rights for all and at least one left for Shaggy. Demi-fog lingered and Shaggy and I guessed at where we were (two different spots) before exited and it turned out we were just south of Incinerator. You could see two Parks Canada trucks on the beach down at the cove and Cindy said a Pacific dolphin washed up on shore (cut and bruised, likely bashed into a rock outcropping in the large swell). They had returned it to the water and were supporting it hoping it would revive. A little spooky on the water, but more relaxing than yesterday somehow. Channel. Strange set-up – still XXL down at Lufkin and up at tinnies but there was an almost open channel out in front of Incinerator beconing us out for the evening glass off and we took full advantage – dry trip to the outside – woohoo! Paddled up to tinnies with BWD and Shaggy, but Udder hung out at middles (too ‘crowded’ up at tinnies). Really felt like a massive point break at times (peeling rights and the channel). Party waves shared with shortboard surfer and Udder (me at tinnies and Udder at middles). Took leave after more than a few memorable rides on what seemed to be a kinder gentler version of the XXL swell to shot some pictures in the twilight and the ‘judges’ atop the main rock said the guy in the helmet caught a few solid rides early on at the peak of the waves on the slack tide (fun). This one was one of my favourites for sure! Last edited by C36 on Mon Jul 30, 2018 2:31 pm, edited 3 times in total. What a great week to be in Tofino. The waves look amazing. Nice pics Dave! 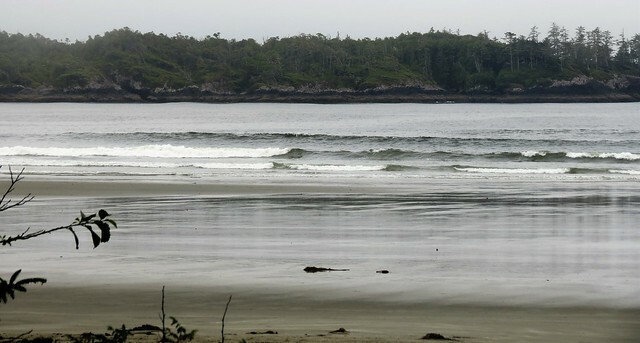 ShonanDB wrote: What a great week to be in Tofino. The waves look amazing. Nice pics Dave! Very grateful for sure - way better than typical 'summer swell'. Birthday cake. Slept in until 8 am. Into town to run errands. Surf checks at South Chesterman and Long Beach and joined Udder and BWD at Wick. It looked like a variety pack (clean small lines in the cove and some fun-sized waves at Lot A). Once on the water the cove was workable (four hit fun) but the larger peaks off Lot A proved tough to catch and Udder described it a `sloshy`. 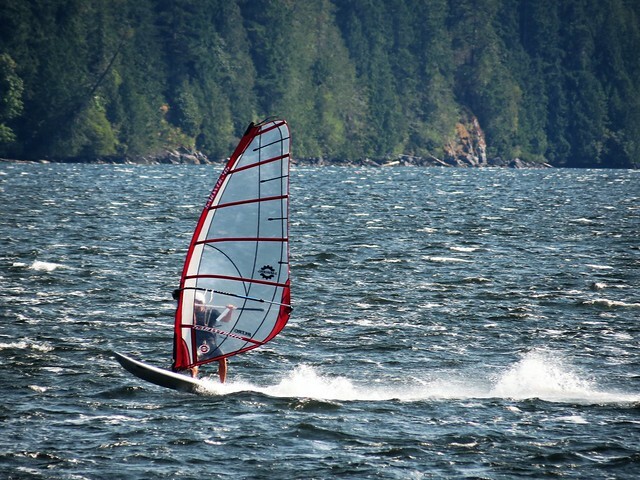 I demoed Cindy`s 8`Odysea log and it felt user friendly and versatile for a 70-something litre funboard. The breeze backed, the sun came out and the peaks off Lot A cleaned up! Some overhead drops, but it stayed easy to get out. Now that was better. Lunch and birthday cake following in the parking lot. Early morning low tide session (second in the parking lot). Decent visibility. Started in Rosie Bay and was treated to some nice clean walls, but they seemed rounder and lacked more energy than what I remembered about this spot. Joined the Deep Cove trio at the south end of SC. The Law, mini-Law, Dunkinguy, and mini-Dunkinguy. Joined in too. Three SUP’s and four surfers in all plus others. Some fun-sized waves! Lots of stoke! Time to start heading east (as swell is starting to taper off). 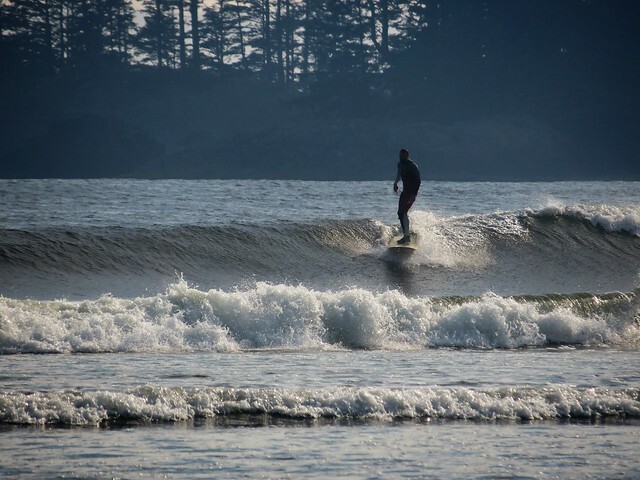 Packed up camp and headed out of Tofino as the swell was starting to melt away (as was the ice – all sold out until Sunday). 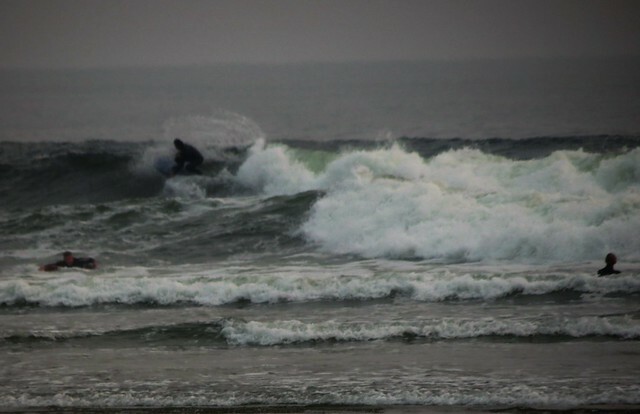 Caught a rather angry evening session at China Creek (strong wind, gusty and poundy chop). Dust blowing on the road even when there were no other vehicles. 5.3/115 felt like race gear it was so spooled up. Rigged 4.5/92 for a bit but a struggle to make it work. Pretty spot, even when it is moody. Grouse, eagle, and scuba divers. Water-view campsite and sunset dinner on the beach. Last edited by C36 on Thu Aug 02, 2018 11:40 am, edited 4 times in total. Wasp sting. Calm at China Creek when I broke camp. Thankful to make it out with four tires (always am). Spray washed the van in PA. Two hour guided tour (thanks to Udder and DavidM) of some fun mountain biking trails in the Westwood Lake (where the commemorative plaque says Udder learned to windsurf) area of Nanaimo. 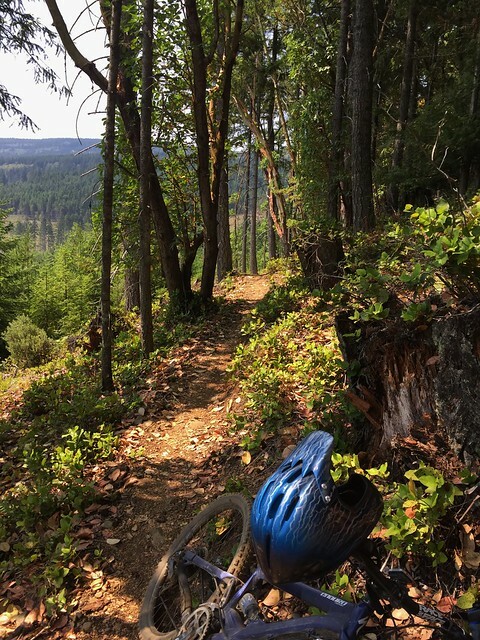 Trails sampled included: Lower Binx, New Binx (these felt like the Whistler Lost Lake cross country trails), Saddle, Rusty Cable, Logging Road, Growler Grind (loose baby head rocks on trail were a nice touch), Quick Link, Baker Street (my personal favuorite), Sophie’s, Power Line, Legalize It, and wasp sting (insect bite, not a trail). Great way to cap off Van Isle 2018! Crisp. First session of the day. Early morning ride with DavidM on Fine China and Finer China (both downhill rolling pump tracks). Super fun way to start the day and told DavidM I thought the hip was justified. Clutch. Second session of the day. Wind filled in and Udder took to the water followed by DavidM and myself. Playful water – slides and lifts. A couple of tense moments with boats that were being driven like they had nobody at the helm. Warm water, fun crew. Fun that! Hunting. Third session of the day. Hunted the bombs but they proved hard to catch due to the `change-up` sizing always seemed to have me too far inside on the mackers and too far outside on the normal sized stuff. One guy out longboarding that was super selective and got treated to a few open waves. Finally caught a few but it took time. Best clean right of the session blocked by three swimmers in bikinis – it was that warm. Calmer. The background south swell was the only one getting into South Chesterman so it was easy hooking up with the one hit wonders in the demi-fog. Modest reward for low risk. A few rides yielded multi-hit open faces, but not many. Crowds were light for the summer. Evening glass off. Started off up at Tinnies and then worked my way south. Some energy to the waves just north of Lovekin near Lot 4. Shared a party wave with Redbaron. Water was still really warm even after all the fog. Sun was starting to turn a faint orange from the forest fire smoke. Water was super warm. More summer fun. Last edited by C36 on Fri Aug 24, 2018 2:26 pm, edited 1 time in total. Fin test. Breakfast atop Incinerator Rock. Chatted out on the water between waves with New Westinster longboarder about SUP, helmets and fin options. Waves were mellower, but a touch close-outie. Demi-fog again (only lift completely once, briefly, then closed in again). Fin test: quad versus tri. I like the tri more (a little slower to get going, but better drive through the bottom turn, easier to reach the lip, and more pivot at the lip (for me). Nice relaxing way to start the day. Rolling thunder. Smoke built throughout the day and it was starting to feel a bit like Kelowna last week. It also felt strangely muggy. 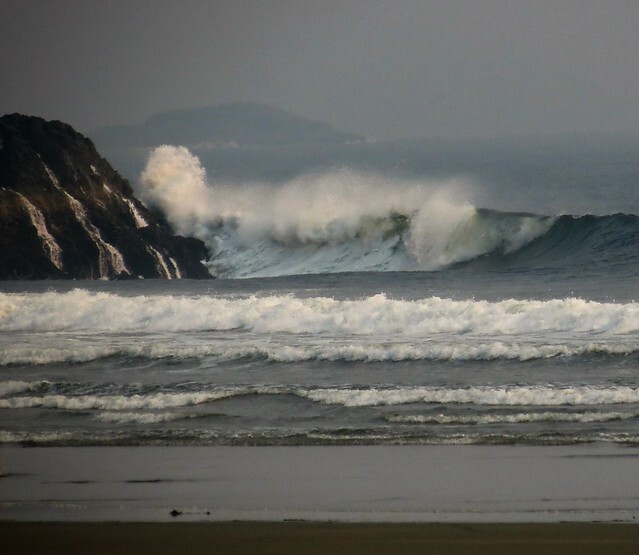 Someone didn’t get the memo – the south swell rebounded at Long Beach tonight. There were some heavy waves rolling in with consequences. Got a front row view of one skilled shortboard surfer tuck in and briefly get ‘pitted’ within the almond shaped green room. Banfielddave crushed a left shortboard surfing, later free fell down the mine shaft dropping in, and was later mowed down by a tourist on SUP (not cool). Redbaron was on point and ripped several lefts and mentioned he witnessed me kick out from a rather mean one (spidey senses were tingling). Caught a few bombs come closouts and a few semi-open waves (one where my fins felt loose like I had lost one or was dragging my leash or some bull kelp – odd sensation that) and more than a few on the head and a couple of tummy rides to exit the impact zone and regroup. Jessie mentioned it has been a while since he has been held on the inside like that. Both fun and challenging at times. Decided to take a few smaller cool-down waves further north in front of the rock – that seemed simple and fun! Reheated leftover dinner atop Incinerator Rock. Last edited by C36 on Fri Aug 24, 2018 2:36 pm, edited 1 time in total. Morning (yellow) sun. First day of the trip treated to morning (yellow) sun (no smoke) so drove straight to Long Beach. Arrived to glassy waves. Quick breakfast and then joined the post-dawn-patrol-but-still-kinda-early crowd. Thought the 3 mm short sleeve might have been a mistake when I felt the cooler water (larger swell from last night must have rolled the ocean over slightly), but the muggy air made it comfortable. Lots of SUP`s out including Mario, SouthCarolinaSUPer, myself and TheLaw. One guy out sans wetsuit on vintage longboard and no leash (he eventually went in and grabbed a wetsuit). Some size lingered but it was MUCH mellower than yesterday. Easy to commit down at lot 4 (without the heavy dump inside) and playful out in front of Incinerator. NW started to show up early on at the point then lifted (good). The glass hung around! The yellow sun (no smoke) was a bonus! Awesome morning and lots of smiles. 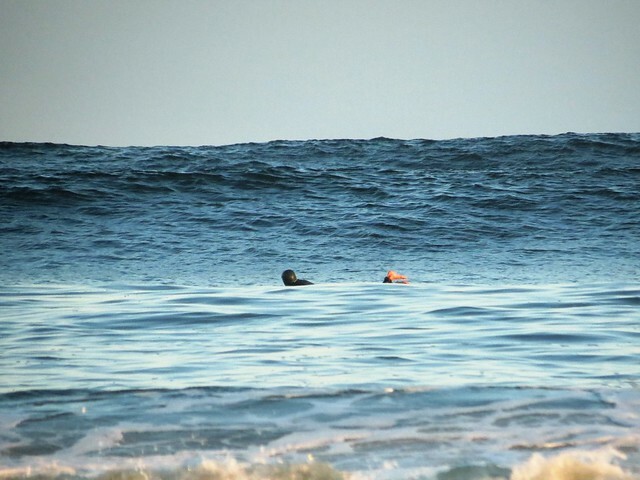 One example: New West Longboard girl`s last day - she dropped into a nice clean right early on and was all smiles. Similar. Spent the whole day at Incinerator. NW wind teased briefly around five pm (classic dinner hour sea breeze). Took to the water about 6 pm. Similar to this morning (size and glassy), but inside sandbar was a little meaner to start with on the low tide. Funny part was there were only three of us out and as I was paddling out after my first wave guy on shortboard hits an impressive aerial, lands and gets washed. All good except when he got pounded he was so close to me I could have touched him with my paddle. When I mentioned that it’s a big ocean and I would appreciate it if he left a little more room next time he gets all pissy – some people are really strange. Waves had some energy down toward Lufkin and I saw Riley pretending he was in Maui sans-wetsuit and boardshorts ripping on a very active board. Asked a shortboard surfer who watched me drop in about four times if he had any tips for me and he said,”Keep doing what you are doing.” That sounded like fun to me. He also provided a few detailed pointers too. Orange sun as some smoke closed back in. Dinner atop Incinerator Rock again (hard to pass up). As I was walking in I mention to a guy flying a drone at dusk that Long Beach is the flight path to the airport. Just then his drone starts flashing all red and told him to land immediately. At least this guy was thankful for the warning. Fun day at Long Beach.